By Blue Cube	on Friday, 17th Aug 2018	in News. What are the benefits of Solar Covers? Do you like jumping into a cold pool? No, then before you invest in a pool heater or crank up your current heater have you thought of solar covers? Unless you have a slatted solar cover most covers will not increase the temperature of your pool. Yes they will help with evaporation and chemical loss but a solar cover can do all this and more. With a small investment you could be saving money all summer and enjoying a wonderfully warm pool. Although simple in form solar covers will transform your summer pool experience. They may just look like a roll of bubble wrap but solar covers are perfectly designed to heat your pool using the suns rays, reduce water and chemical evaporation and keep your pool clear of debris, what isn’t there to love. A 16’ x 32’ Geo Bubble costs just £475.20. With less chemical and water evaporation you will save money and time by reducing the need to top up your water levels and constantly add more chemicals to keep the levels perfect. With a reduction in debris you’ll get less algae, clearly this seems like a win win. 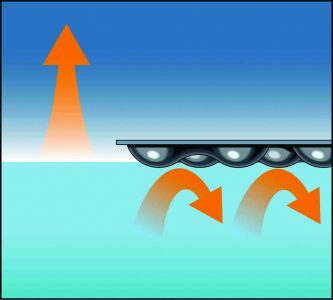 However, some people find the need to use and remove the solar cover a little annoying, to simplify this you can use a solar roller to make the process easy. 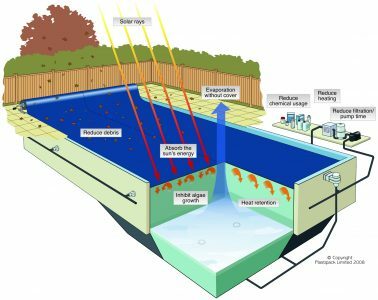 Solar covers work by harnessing the energy (heat) from the sun and transfers it to the water, in the U.K this will probably not be enough to heat a large pool but it will significantly reduce your energy bills especially is you use and electric heater. Not all solar covers work in the same way so it is important to find the right one for your pool, if you have any questions contact one of our team. When you first receive your blanket it may not fit perfectly but this is easily rectified with a pair of scissors. Leave a flap 2 – 3 inches long where your skimmer is so you can tuck it under the edge of the skimmer. This allows you to push debris into the skimmer before removing the blanket. Keeping your cover on during the day will allow it to heat your pool, however if used at night it will still reduce evaporation and heat loss. Once the season has come to an end it is time to swap covers and put your solar blanket away, to avoid any nasty surprised next season, it is important to clean and store your cover properly. One removed from your pool lay it flat on your grass (concrete will damage the bubbles) with a soft broom remove debris, then fully rinse and allow to dry (do not leave it on your grass to dry as it will burn your grass). Once dry it can either be rolled or folded to store, try and keep it in a sealed container as mice think they are great for nest building. Liquid solar covers have been increasingly popular this year as they offer similar pros to the solar covers but without needing to put it on and off. A one-molecule-thick layer of fatty alcohol sits on the surface of the water, inhibiting the water’s ability to evaporate normally. 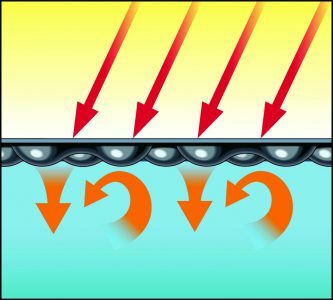 Preventing evaporation prevents heat loss. However it will not keep debris out. If you decide you no longer want your liquid solar cover all you have to do is wait as like all chemicals it will slowly evaporate, with this in mind it is important to keep up with your regular dosing of your liquid solar cover in order for it to work efficiently. The liquid solar covers are completely safe for humans and pets and won’t harm your pet if they take the occasional drink from the pool, it leave no residue on clothes and does not cause any irritation (however very sensitive skin may react). How do saltwater pools work?